Analog Voltage Divider (SKU: DFR0051) The Voltage Divider can detect the supply voltage up to 25V. The DFRobot Voltage Divider module is based on resistor divider principle. The voltage detection module allows the input voltage to reduce 5 times. As the Arduino analog input voltage is up to 5V, so voltage detection module's input voltage can not be greater than the 5Vx5 = 25V. val=analogRead(0);//This divider module will divide the measured voltage by 5, the maximum voltage it can measure is 25V. 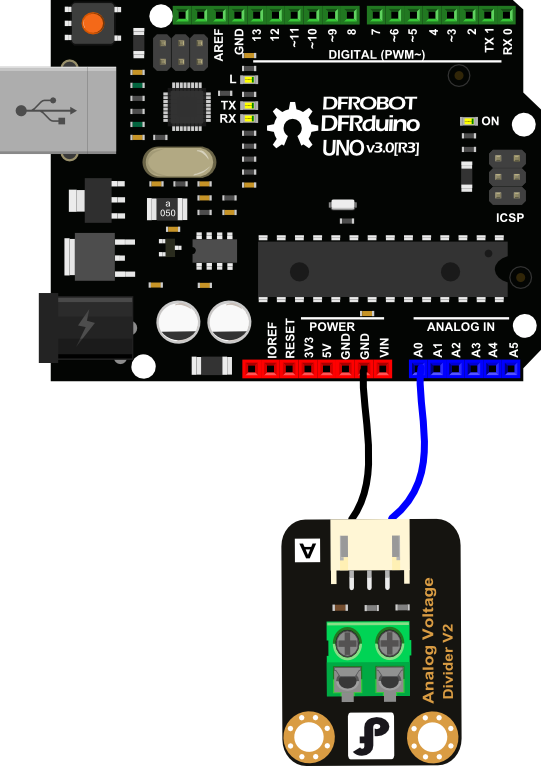 Get Analog Voltage Divider V2 from DFRobot Store or DFRobot Distributor.